The Reservoir remains one of the city’s most beloved urban parks. It’s in dire need of a refreshing and the city plans to replace the bathing facilities, shade spaces, main deck and concessions area heightening accessibility, safety and sustainability. Our Reservoir will be even better with the addition of a community-envisioned boardwalk, path and overlooks, picnic pavilions, shade, indoor-outdoor fire pit and a playground. Together we can leverage the City's investment to help Boulder reach its full vision for the Boulder Reservoir. BOULDER LIVES OUTSIDE. Whether relaxing with neighbors on a beautiful Colorado evening or training for a triathlon, we are driven to experience our fullest lives outdoors. OUR GOAL is simple. With community stewards, we seek $350,000 + in charitable gifts to leverage the City of Boulder Parks and Recreation investment so we can build additional improvements at Boulder Reservoir. How? 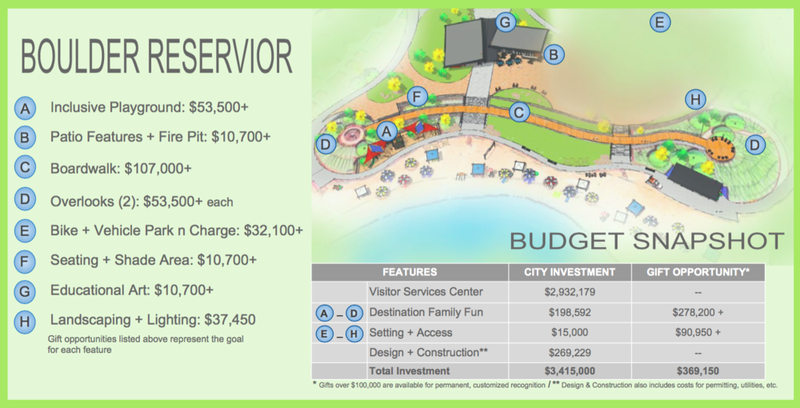 If we reach our fundraising goal, Boulder Parks and Recreation will ensure each individual project is completed in full. WE INVITE YOU to consider this opportunity and make a long lasting impact in Boulder. Questions about the Campaign for Boulder Reservoir? Want to Join our PLACEMAKING efforts? Email info@playboulder.org to get involved. intention of creating public spaces that promote people's health, happiness & well being.